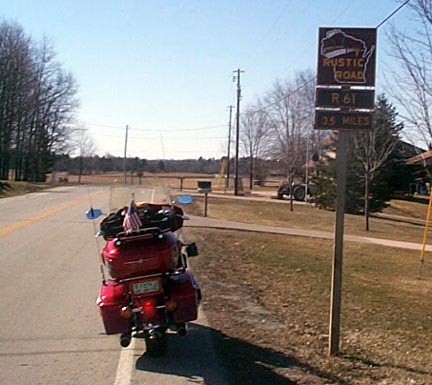 The WI Rustic Roads Award Program is set up by the WI DOT to encourage motorcyclists to enjoy the Rustic Roads System throughout Wisconsin. 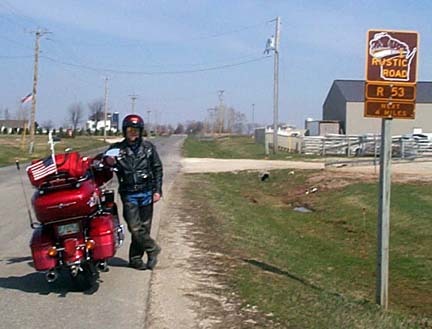 Ride 10 of these roads and submit proof and you receive a patch, 25 and receive a special certificate. 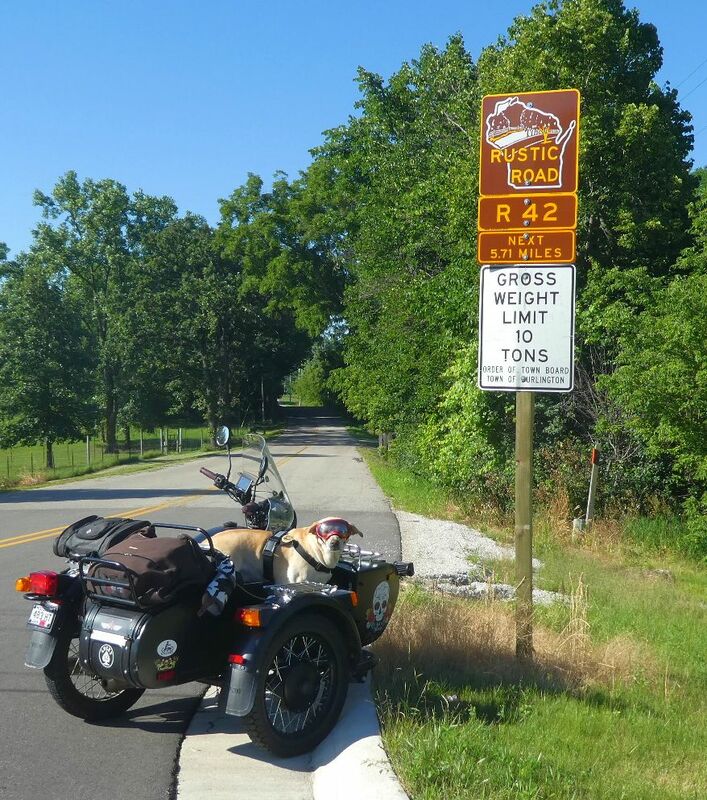 Together with my dog, Annie, we rode the first 10 roads in June & July of 2017 and the photos that follow are in the approximate order they were ridden. This year, I've decided to begin a little adventure and ride all 120 of the roads in the system. I"m not sure how long it will take, maybe a couple years; but I will document it in words and photos, on this page for anyone interested. Looking back - It started simply enough. As I began my final year of being "in my 50's", I realize that I may not be able to ride my 850 lbs. Yamaha Venture forever. My wife seemed to take some devilish pleasure in reminding me that "you're getting old". Of course, she is also getting............ less inclined to hop on the back of the Venture for long rides anymore. 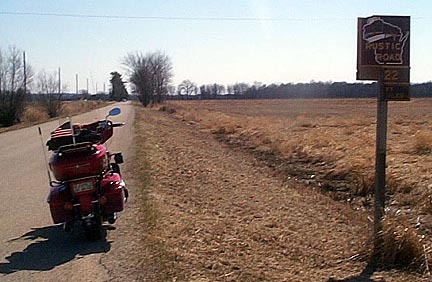 I've never been a huge fan of trikes, in part because every old fart seems to get one, in part because they lack any real uniqueness and in part because they offer no advantage (other than stability) over a 2 wheeler. You can't carry more people and you can't haul your dog on a trike. Plus - I've always liked sidecars. 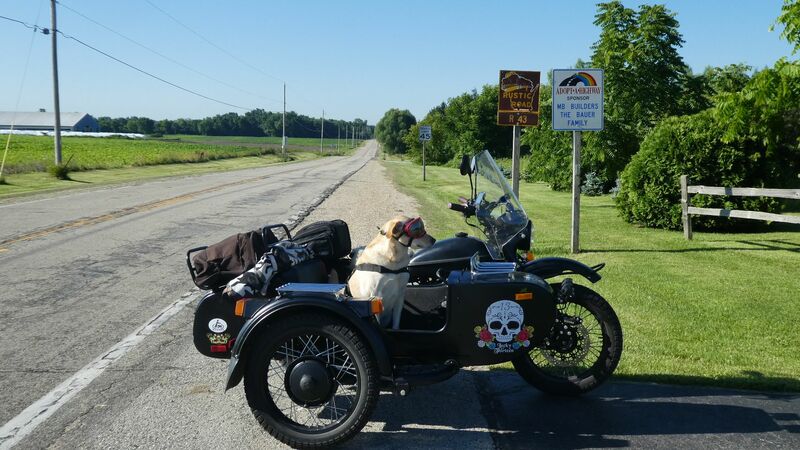 I also thought my wife might like traveling in a bit more comfort and with more weather protection - things you get with a sidecar, but not on a trike. But I'd also heard they were much different to ride and that they handle much different than a motorcycle. And I wasn't sure I'd like the differences. So before I shelled out big $$ to modify my Venture and add a sidecar, I thought I'd pick up a used rig for a few grand and test it out. 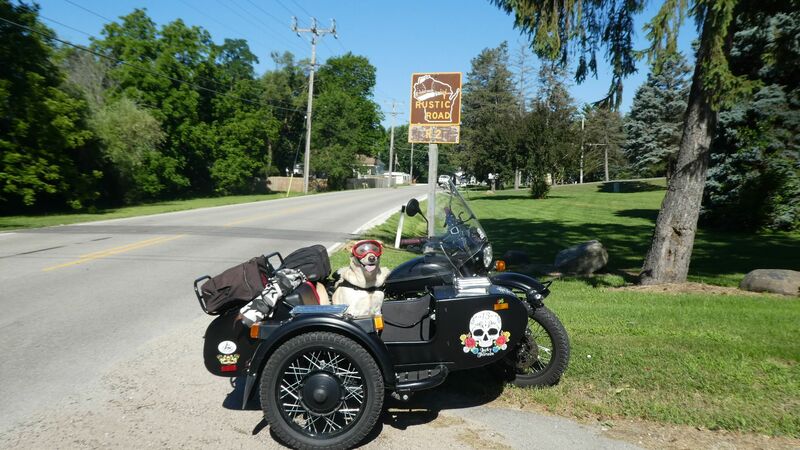 In April of 2017, I came across this used 2013 Ural located in Oconomowoc, so I went and checked it out. After conferring & discussing it with my wife - I bought it. Of course, then I had to learn to ride it. My wife, who is a bit superstitious, was not fond of the year - 2013 - feeling that was an unlucky number. So being a person that likes to taunt Fate more than a bit, and as a tribute to her Latin roots - I call the bike "Trece Suerte" or Lucky Thirteen. I even found a few Lucky 13 decals and some Dias de los Muertos skulls - Day of the Dead or Sugar Skulls as they are called - to adorn her with. For the next month, I took short rides familiarizing myself with the handling differences and with the locations of the controls. They do handle much different, especially in the corners. Sidecar rigs (or "hacks" as they are called) cannot lean in the corners and they tend to lurch a bit from side to side when you shift or apply the brakes. 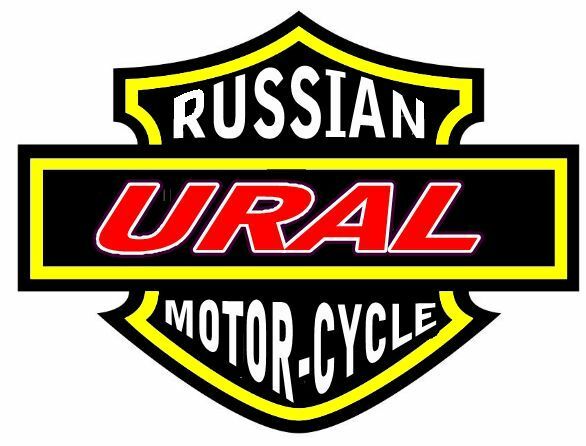 A few words about the Ural motorcycle are in order. They are made in Russia in the Ural mountains. If it looks like a restored antique bike, it's because superficially, it's not much different than when the Russians "reverse engineered" the design from the Germans in 1941. They have a 750cc air-cooled engine and a top speed of 70 mph.........for short bursts. 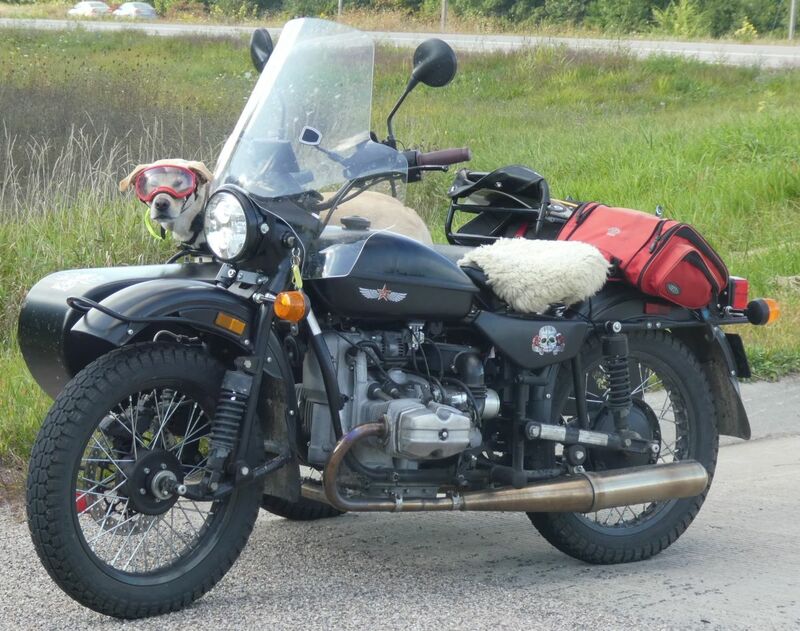 It can go 55-60 mph all day, but you will probably never see a Ural on the super-slab or the Interstate. 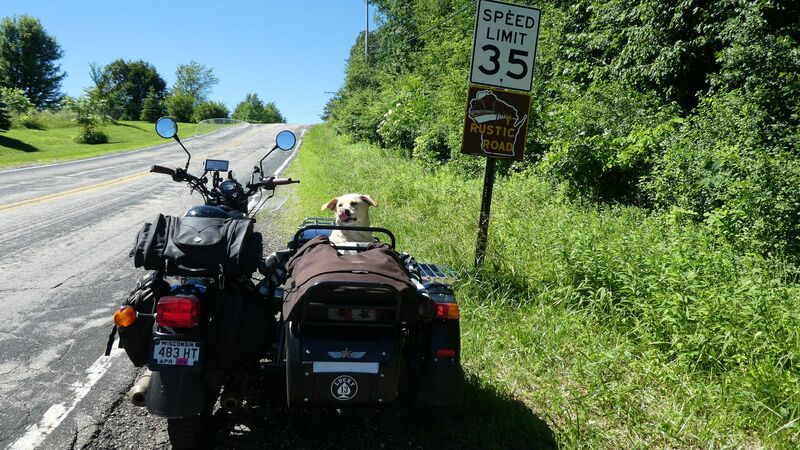 And if you ever get passed by a Ural - you are probably driving below the speed limit. It's not a speed machine, but it's perfect for tooling down the country roads and smaller state highways. It hearkens back to the old days of motorcycles, when motorcycles and Life were more simple and basic....and fun. There are no electronic controls, no bells and whistles, no cruise control or radio. All of which you can live without. Once I got proficient on this new machine, the next step was teaching my Yellow Lab, Annie, how to behave and ride in the car. Getting her used to wearing eye protection was the biggest challenge. I tried Doggles, but she would paw them over her nose or rub her face on my leg and push them up over her ears. Then I got some Rex Specs and she liked them better. Well, she didn't try and take them off as often. She adapted to the noise and motion very quickly, got used to her safety harness and the short lead to keep her in the car in case of a squirrel attack, a random bunny sighting or if she saw another dog she wanted to befriend. After a few rides, I realized she did NOT like seeing the world thru the plastic windshield, so off came the sidecar windscreen and she loved it. 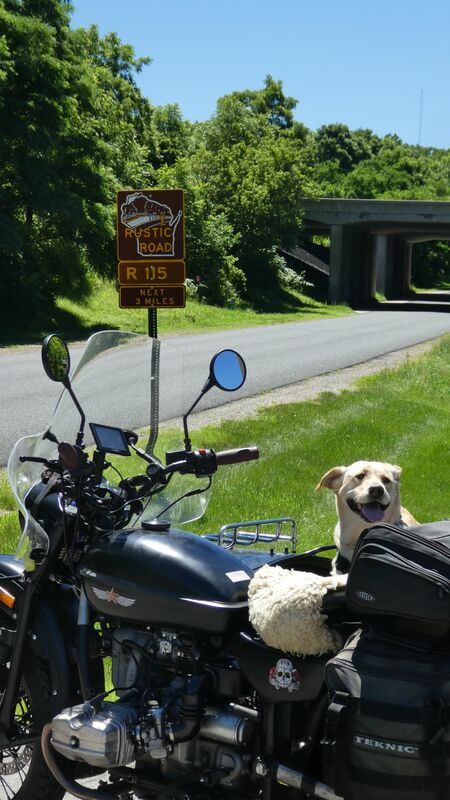 Now she could ride with her nose over the sidecar and lay down if the wind got to be too much. 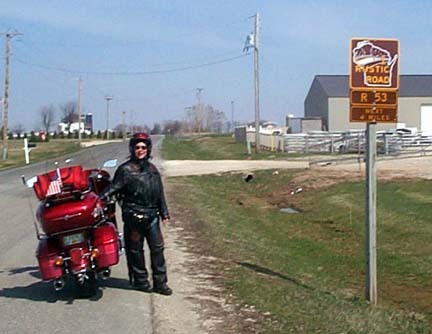 Soon we were riding 10 hours and a few hundred miles on a weekend day. 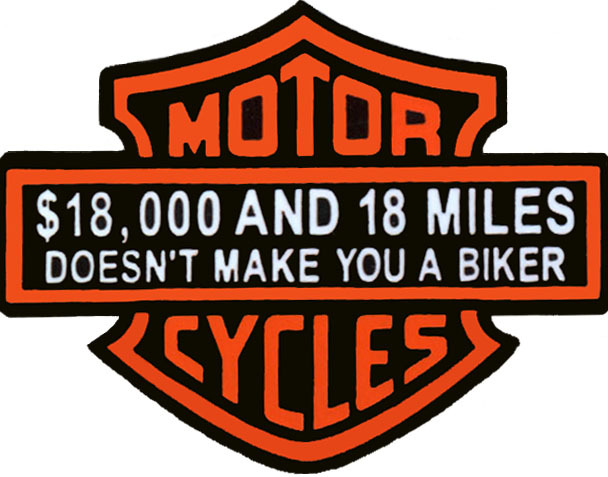 Most every biker will tell you, it's not about the destination, it's about the ride. Which is true. 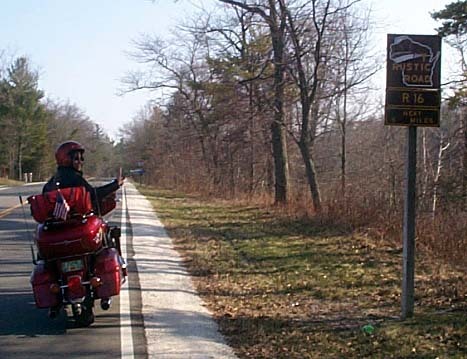 It's also good to have a destination just to give you that incentive to actually get out and ride. Having ridden some of the Rustic Roads before on my Venture, I thought these would be perfect roads for the Ural. They are made for each other. 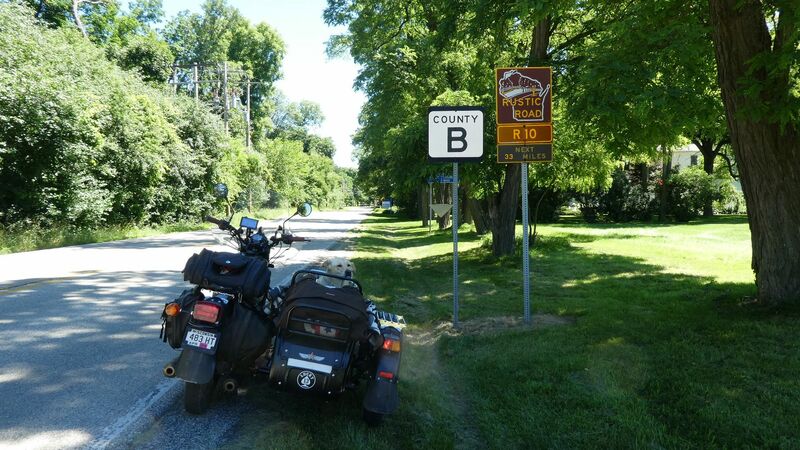 Together, Annie and I rode the first 10 Rustic Roads in June and July, then we rode another 5 in September. I always take some toys for her, her Frisbee doubles as a water dish and some snacks for both of us. If there's a spot for her to swim, or a woods to run in, she gets to do that. Everywhere we stop for gas, or sometimes just at stoplights - people have to take her picture. And she loves people! I sent the pictures into the Dept of Transportation and waited for the patches. Finally, they arrived and I put Annie's patch on her harness. 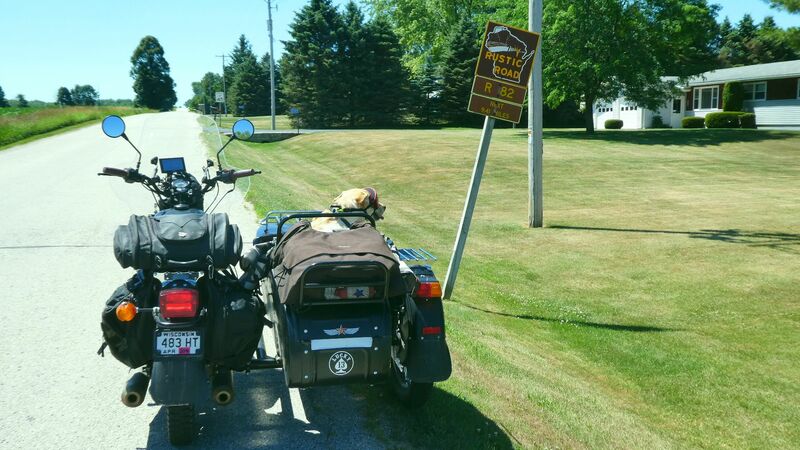 To the best of my knowledge, she may be the only dog to have received the WI Rustic Roads Motorcycle Tour patch. 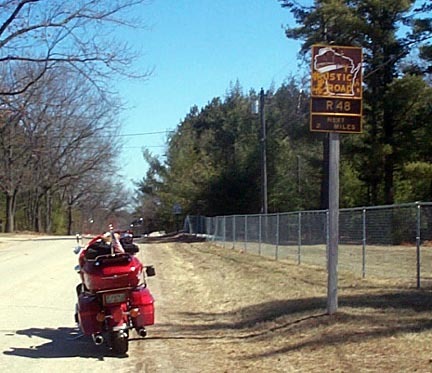 That got me thinking - why not try and ride ALL 120 Rustic Roads in WI? And maybe - try to see all 47 state parks in WI? 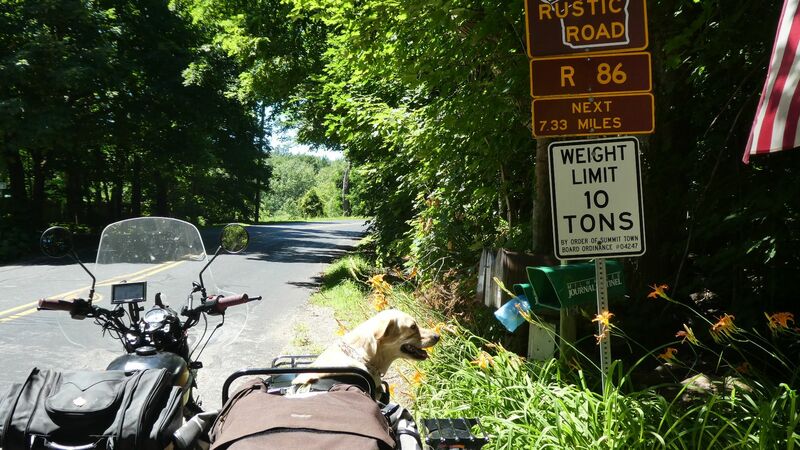 I don't know if anyone has ever ridden all 120 Rustic Roads on a motorcycle before, I doubt anyone has done it with a sidecar motorcycle and it's a pretty good bet no one has EVER done it with their dog! 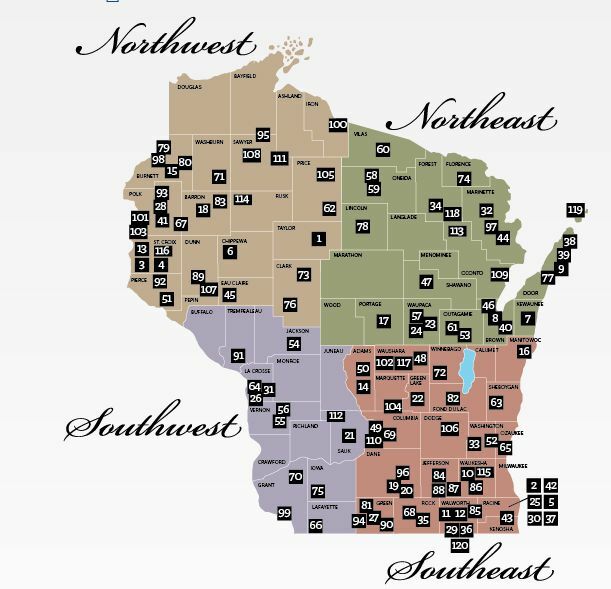 So that's what we're going to try and do - a fun little quest to see the Wisconsin countryside, take some pictures of our beautiful state and have some fun. 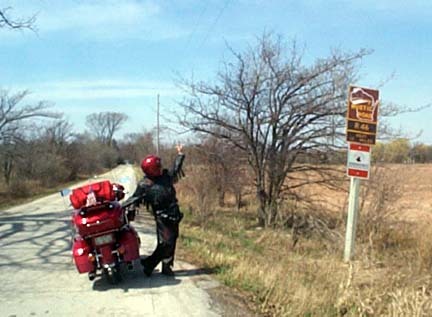 I'll write about the various roads and trips here, if for no one's amusement other than my own. If you have questions or comments - feel free to drop me an e-mail - there's a link at the top of the page - or say HI if you see us in a gas station. And be safe out there! 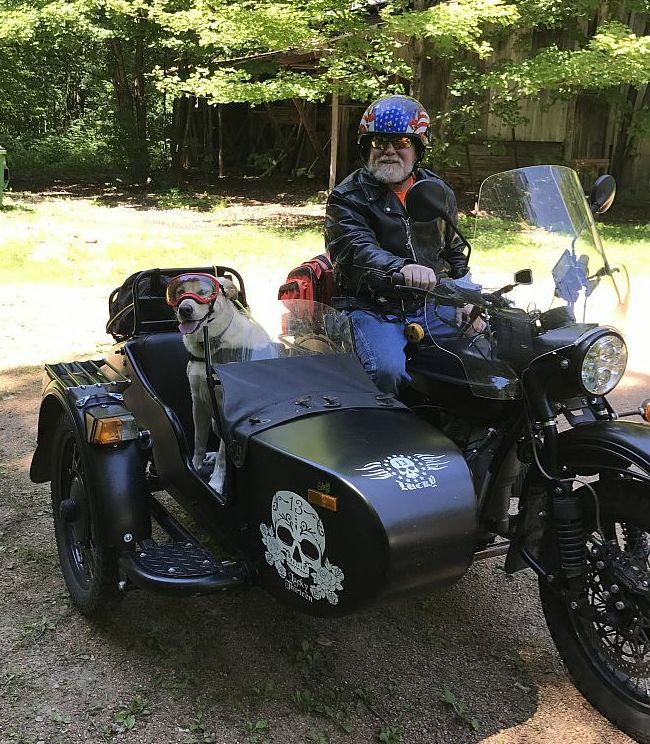 2017 on the Ural with my yellow Lab, Annie. Annie and I road these together - first 4 on June 17 and next 6 on July 1, 2017. In 2017 this road was most torn up and gravel - looked they were getting ready to re-pave it. Short, very shaded - watch out for deer. All paved, nice little road. Connects with #48 on the east end. Be sure to check out the covered bridge and park. Mostly gravel, nice panoramic views. 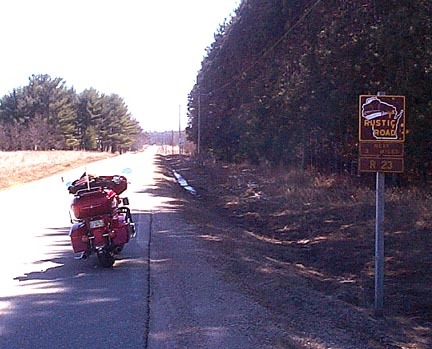 Rustic Road #22 - Green Lake County - no sign at N end of this road. A large portion at the northern end is VERY rough & rutted, lots of loose gravel. Keep a tight grip on the bars if you are on 2 wheels. 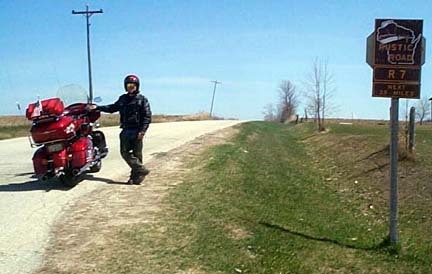 A beautiful scenic road - classic WI farm country. A classic sand country road - soft sand and gravel, but not too rutted. 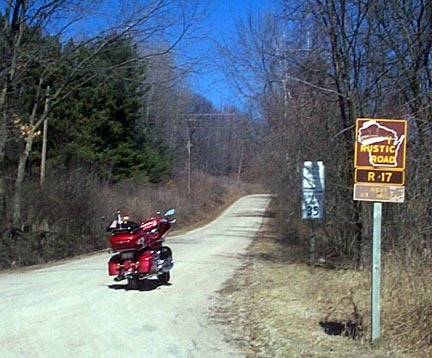 Rustic Road #17 ~ Portage County. 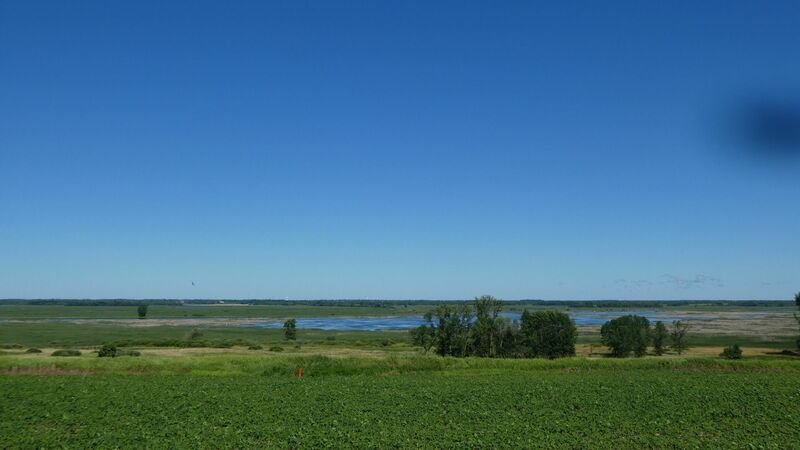 Very nice scenic country road - classic WI farmland & woods. 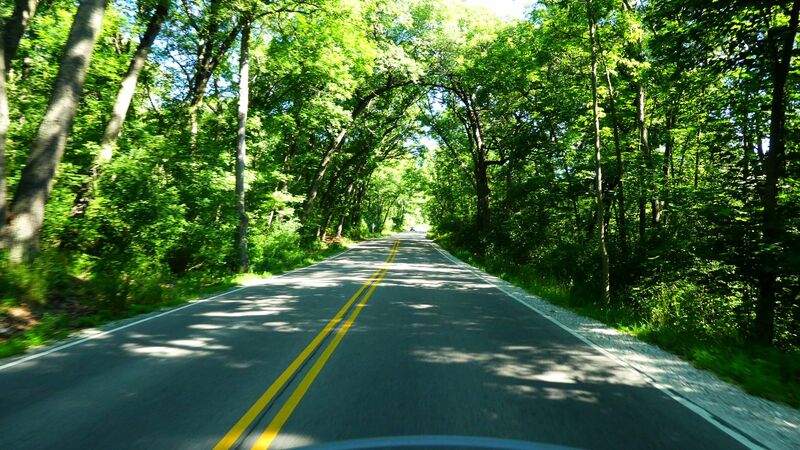 Very nice drive, some beautiful woodlands with green glens. The # portion is missing - but if you look closely - someone scratched it in. Nice road, runs from Lakewood to Mountain. 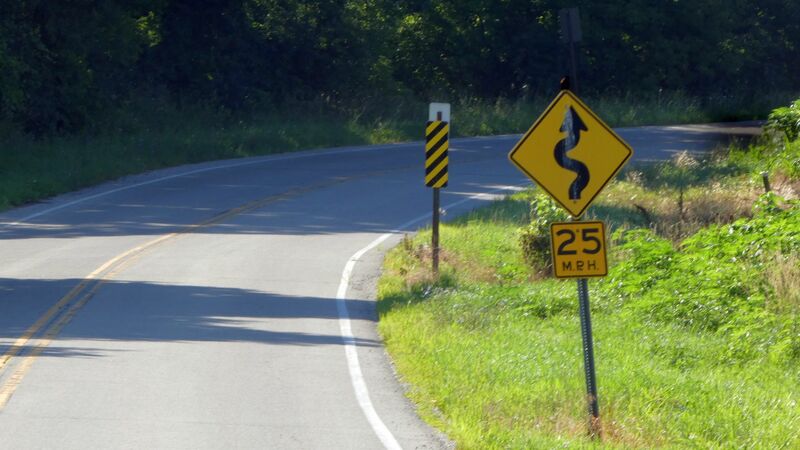 Nice gently curves, would be pretty in the fall, I bet. Another shot of #113 - very nice road. Don't be fooled by first appearances - most of this road is loose gravel. Not much special about this road. HWY 167 & ST. AUGUSTINE RD. Turns are poorly marked, study a map before setting off. Lots of tight turns, blind corners and hills. 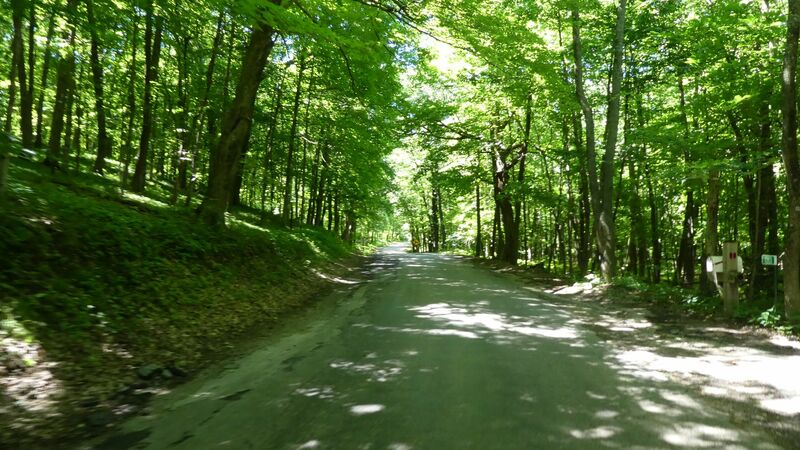 Road is rough in many spots, beautiful canopy of trees over much of the road. Nice turns, decent pavement. Runs thru a community of lake homes - not really very scenic, but nice. Runs thru some rolling hills, farmland scenery. Connect to #10 at the north end. Nice road, turns are pretty well marked. Some tight corners. Very shaded under a canopy of trees. No sign or road # designation at South end. Nothing really memorable on this road. Some nice tight corners on this road. 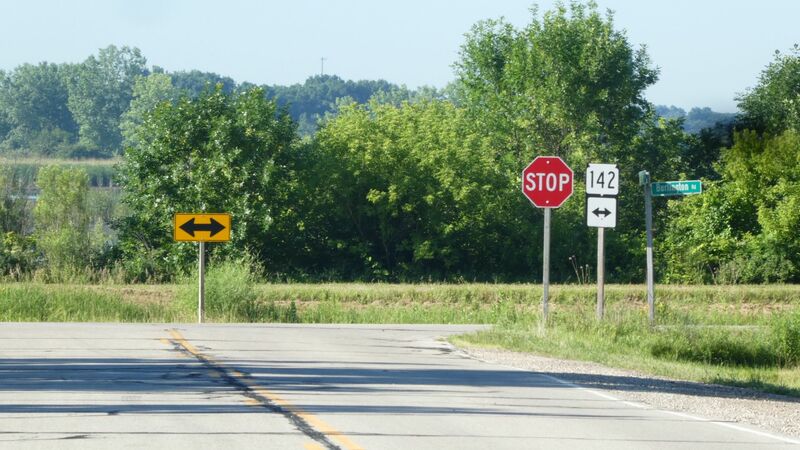 Several roads are included in #42 - watch for signs. at the South end in Burlington. Several turns are NOT marked - study a map before setting out. Nice pavement, some nice scenery, very pastoral. Watch the turns not all are marked for speed. 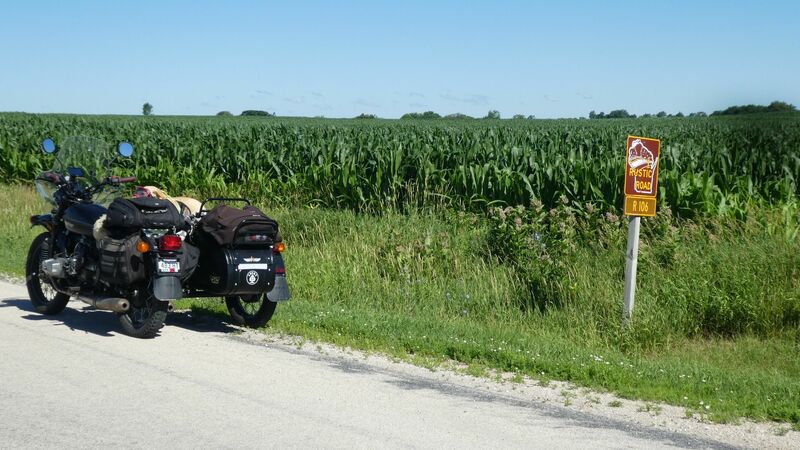 Classic WI farmland, hilly and some fun turns and corners. 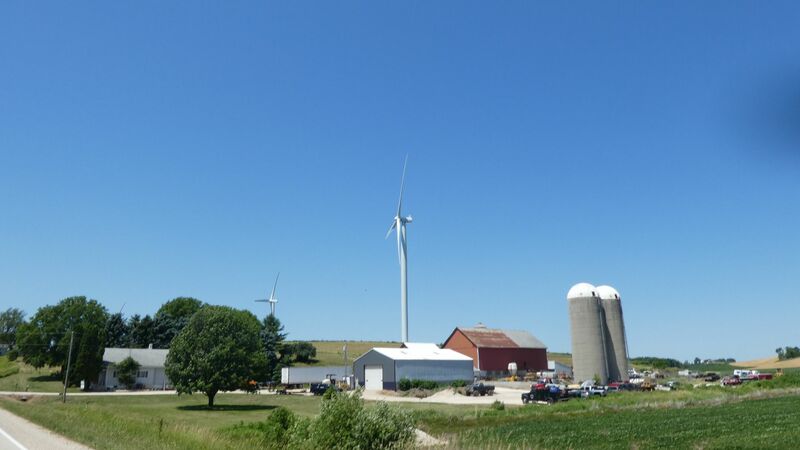 Runs thru some huge wind farms - turbines all over. 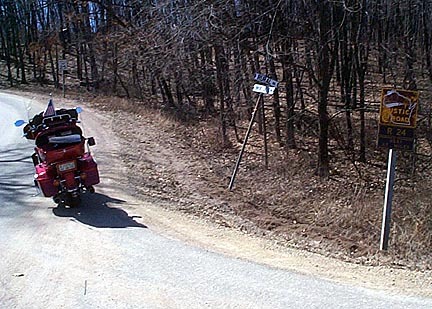 Also runs thru parts of the Kettle Moraine State Forest, so the terrain in pretty hilly. 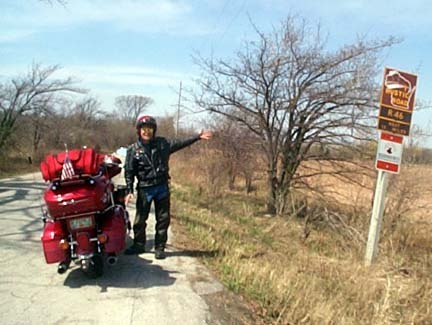 I did the first 8 roads on April 3, 2005 and covered 280 miles by the time I was back home. Hwy MM just north of Hortonville. Nice easy ride, good pavement. 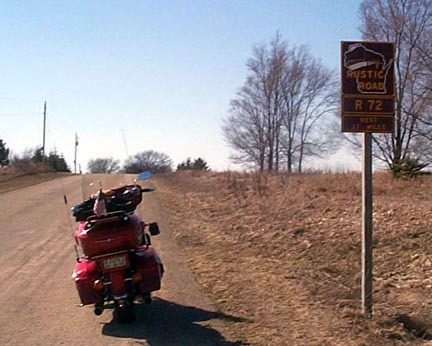 I accessed this off Hwy 10. Watch for sand in the corners. Pavement is mostly good, but the sign marking the turn onto Town Line Rd, just after Cobbtown, is down. Watch for the turn or you'll miss it like I did. 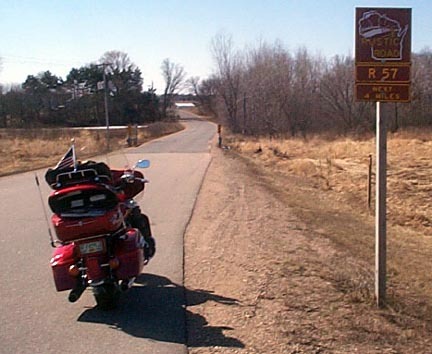 I roade Hwy 54 w , then turned N on Hwy D. follow that for a bit (nice ride) to the junction with Hwy T. Take T until you run into #17. Again, watch for the right turn onto Otto Rd, the sign is not there. Very nice road. Heading E on hwy 54, I turned onto Hartman Creek Rd. Just before you enter the state park, #23 goes off to your left. Not tremendously scenic for the first part. The ride thru the town of Rural is very pretty. #24 intersects #23, so I rode it to the dead end and turned around to finish #23. Very scenic, lots of turkeys out in the fields. This "road" is a 1 lane rutted, potholed, 99.9% gravel, sand and mud path thru the White River Marsh. A flock of turkeys challenged me for the right to be on this piece of dirt. If it was wide enough to turn around, I would have. Also part gravel, but not as scary as #22. Pretty, but not spectacular scenery. Road is fairly straight and boring. Rustic Road #53 Just West of Hwy 41 near Kaukana, nice little country road. Rustic Road #46 Off Hwy 57/32 just S of DePere. Some BIG houses on this road. The most scenic of the day. 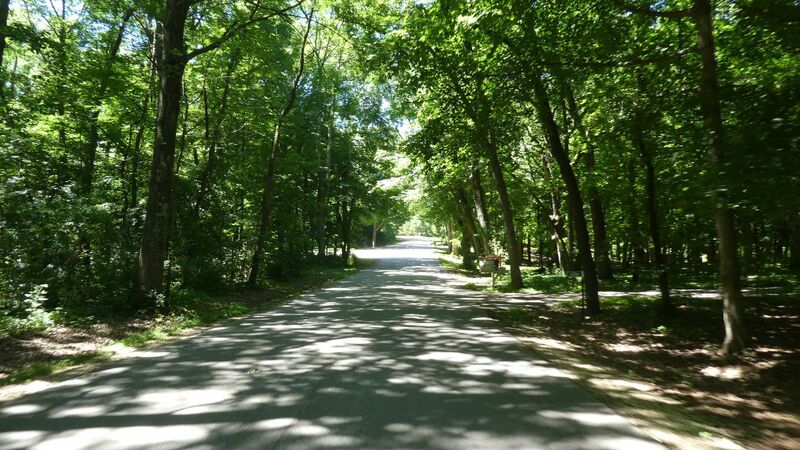 Runs thru Point Beach state forest and along Lake Michigan, very nice pavement, beautiful scenery. The road was a little angled, so I hopped of and took the pic.